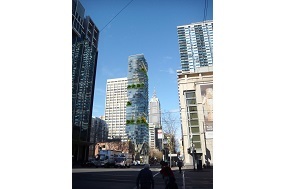 Windtech provided the wind engineering services for the 120 metre high residential tower in the Melbourne CBD. 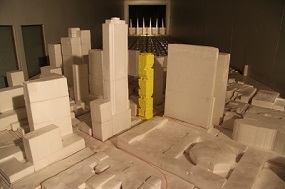 The tower is located on a relatively small site measuring only 21 metres by 18 metres in plan and is bound by Russell Street, Little Lonsdale Street and Hayward Lane. Windtech carried out a detailed wind environment study to ensure that adequate wind comfort was achieved for all accessible areas within and around the development site. This included working with the lead project architect team to achieve suitable conditions for wind sensitive areas that also aligned with the architectural intent for the project. Part of this study involved measuring the existing conditions around the site to accurate determine the impact of the subject development on the local ground level wind conditions. Furthermore, Windtech determine the wind-induced structural loads acting on the structural framing of the development. Due to the high aspect ratio of the development, the structure is susceptible to potential adverse wind effects. Consideration was also made during this study for the impact of future buildings which are proposed for areas in close proximity to the subject site.